fjmt was commissioned to design and develop a key residential site, adjoining the Doncaster Hotel at the corner of Anzac Parade and Doncaster Avenue. 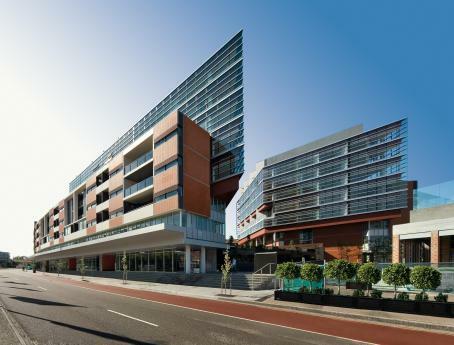 This project embodies design excellence and a commitment to urban and sustainable design providing a mixed-use development that incorporates a substantial contribution to public open space and urban amenity, balanced with a variety of accommodation types. The ground plane of the development integrates a buffered new urban square that is protected by streetwall buildings from the pollution and traffic noise of Anzac Parade and Doncaster Avenue. Retail, restaurant and cafe use will be accommodated at this level to link street activity with that of the newly formed public open space. Carefully placed openings at street level will lead visitors to this new public space. Above ground level are various apartment types aligned with Anzac Parade and Doncaster Avenue and the set back twin apartment buildings that provide the strong symmetrical expression to the Doncaster Hotel.